Built to last. This is one of the toughest ice boxes known. Made from tough UV stabilised, FDA APPROVED FOOD GRADE polyethylene which means it is safe for all to use. No nasty chemicals leaching into your food and drinks. The ONE PIECE MOLD is extremely tough with no welds or joins to break, unlike a 2 piece mold, a one piece mold has greater longevity and unbelievable insulation properties. Strong impact resistance also so you don't have to treat it with kid gloves. The Chilly Chest can handle both extremes in weather and just about whatever you can throw at it OR in it. The fact is our ice boxes have very thick walls and lid- both Polyethylene outer and Polyurethane insulation. The total weight of our 100 litre ice box is 16.25 kg. This is, on average, more than 3-4 kgs heavier than most other leading 100 litre ice boxes on the market. IMPORTANT- Look for the inner and outer dimensions, and WEIGHT of an ice box to give you a true idea of how much raw material goes into the product- and ask the manufacturer if this information isn't provided. This is a massive indicator of strength and how well it will keep your ice frozen. If you don't see all dimensions and weight of an ice box given by a manufacturer you should ask the question for your own peace of mind. The simple fact is that more raw materials means more cost for us to manufacture BUT we want to give you one of the strongest and best performing, best insulated ice boxes at the same low price. Please take the time to compare for yourself. Ice retention. 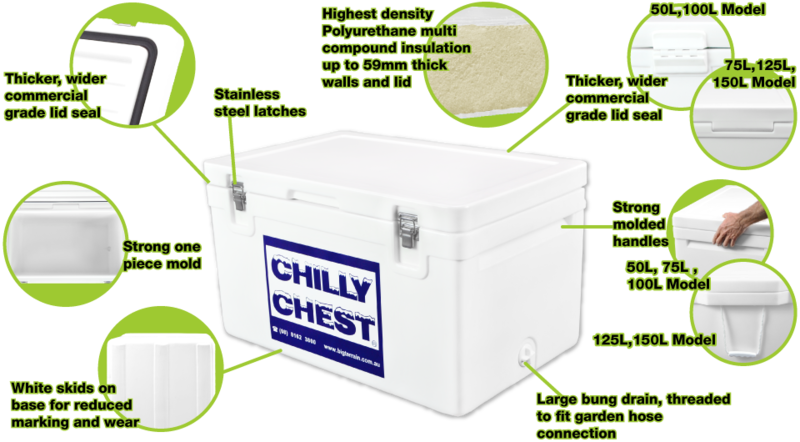 The Chilly Chest is manufactured to our most stringent design specification and we like to keep things cold!!! The more durable ONE PIECE FOOD GRADE polyethylene mold (no welds or joins to break) is injected with polyurethane at high pressure within a closed cell- unlike a 2 piece mold. The walls, lid and base are thicker than most (please take a look at our video tours to see how much thicker they are) and this means much better ice retention for you. The fact that we utilize a one piece mold is because we want you to have the best. A one piece mold allows effective pressure injection of polyurethane insulation achieving fantastic insulation density and less chance of weld breakages than a 2 piece mold- look for this in any high quality ice box- make sure you look inside the lid rim before deciding! Superior design features. Our design team slaved for months to come up with the best features imaginable in an ice box. The mold is shaped so that virtually everything is recessed with mininal protrusions. FACT IS- latches and handles are generally the first things to go on an ice box- they catch on things and break as you are loading or unloading. The latches have been recessed so they're much less likely to break off or scratch exposed surfaces. The handles are recessed molded ledge- again, no protrusions means strength and less likelihood of breakage. In short these design features make loading in a car, ute, truck, caravan, boat or trailer much easier and are much less likely to cause damage to the ice box or anything surrounding it. Makes sense right? Stainless Steel Latches. We designed this ice box in the knowledge that we're a nation that is 'girt by sea'...and we know that ice boxes are fond companions of the beach and fishing boats and outdoor weather generally. Stainless steel minimises risk of degradation due to exposure to the elements. We don't use bungy loops on our ice boxes as they have a very high breakage & replacement rate- ask any one that has bungy loops on their existing ice box and they will tell you. Our stainless steel latches allow a constant pressure meaning that you will have a true seal every time without unnecessary, protruding, breakable hitchings. Plastic Welded Hinges. Strong plastic welded/ chemically bonded integrated hinges have thick oxidant/corrosive resistant centre pins. The plastic weld/ chemical bond gives peace of mind over screw in or pop rivetted hinges that can weaken over time and usage as the bond is over a much greater surface area. We guarantee the strength of our hinges because of our professional manufacturing techniques. Our ice boxes DO NOT NEED internal rope restraints which can get in the way or hinder the lid & effective sealing if caught between the seal when closing. These ropes also dangle in your food, ice and water when closed and we are all conscious of cross contamination of the ice box contents. We only use superior, 1st class manufacturing techniques for all fixtures and fittings- no shortcuts. Made strong for your peace of mind and we guarantee it. White Skids. White skids run along the bottom surface of the Chilly Chest. Most boat surfaces are white so this minimizes the chance of marking. The skids also act to stop the bottom surface of the ice box being worn and structurally compromised by dragging. These are far more practical than base stoppers as they are bonded firmly to the box, allowing for dragging and are far less likely to mark. 7 years manufacturers warranty. Buy with peace of mind in a quality product. Built by a manufacturer with 26 years experience in ice boxes. Why buy from anyone else but a specialist in what they do? Commercial Grade Refrigeration Seal. A cheaper, thinner and poor quality seal will degrade and lose memory very quickly and the true seal can be lost. Some ice boxes use inferior 'door jamb' type materials which do not have the thickness, width and durable memory retention of our high grade seals. The commercial grade refrigeration seal is thicker, stronger and wider than most and this means better ice retention! Our one piece mold means that the inner lip of the box is flat, (unlike 2 piece molds with an undulating surface), meaning that it is much easier to get a true seal every time. Large Threaded Bung Drain. The large bung is located at the lowest section of the Chilly Chest (not an inch or 2 above) to allow for easy drainage. Make sure you see the inside of any ice box you are looking to purchase. The addition of a threaded bung means you can connect a garden hose for remote drainage (so you don't have to stand in a puddle before you move it). This also allows a hose or tap fitting if you want to use the Chilly Chest for dispensing drinking water from directly. The fact that we use FDA compliant FOOD GRADE polyethylene means that you can do this with peace of mind that you are not ingesting harmful chemicals.